Embedded semiconductors in made-in-China components are worrying corporations and the Pentagon. It might turn out that Brett Kavanaugh was only the second most important story last week. The story provoked unusually vehement denials about its accuracy. But concerns about Chinese infiltration of software and hardware are not new in U.S. security circles. Businessweek reported that at least 30 American corporations have been attacked by a rice-grain-sized spy chip. According to the story, it was unearthed by Amazon during its due diligence of acquisition target Elemental Technologies of Portland. The Oregon company’s customers ranged from media outfits to the Central Intelligence Agency. Elemental Technologies’ expensive servers to compress video came from Super Micro Computers (Supermicro), based in San Jose. They were assembled in China, and, according to Businessweek, the “Trojan chip” inserted in motherboards was traced to a unit of the People’s Liberation Army. This 2015 discovery led to a top-secret probe that remains ongoing. Amazon released a detailed rebuttal to what it called an “erroneous article.” Apple, another company named in the story, did as well. For example, Amazon stated: “At no time, past or present, have we ever found any issues relating to modified hardware or malicious chips in SuperMicro motherboards in any Elemental or Amazon systems. Nor have we engaged in an investigation with the government. And maybe this is so. But if the federal government, an important Amazon Web Services client, is investigating the hack, as Businessweek reported, of course Amazon would say this. Given the granular detail of the Businessweek reporting, from multiple sources inside the government and business — albeit anonymous — attention must be paid. Beijing’s ambitions are outlined in the Made in China 2025 plan, an effort to leapfrog the West in numerous advanced industries. Western companies that sent high-tech manufacturing overseas set the table. Espionage and worse are important main dishes. At the same time this Businessweek article appeared, Vice President Mike Pence gave a bellicose speech against China at the Hudson Institute. “Beijing now requires many American businesses to hand over their trade secrets as the cost of doing business in China,” Pence said. None of this is new for anyone who has been paying attention, but for an American vice president to say it in a high-profile speech is new. At the same time, the administration released a Pentagon report saying the U.S. defense industry is too dependent on China, as well as being vulnerable to Chinese cyber attacks. 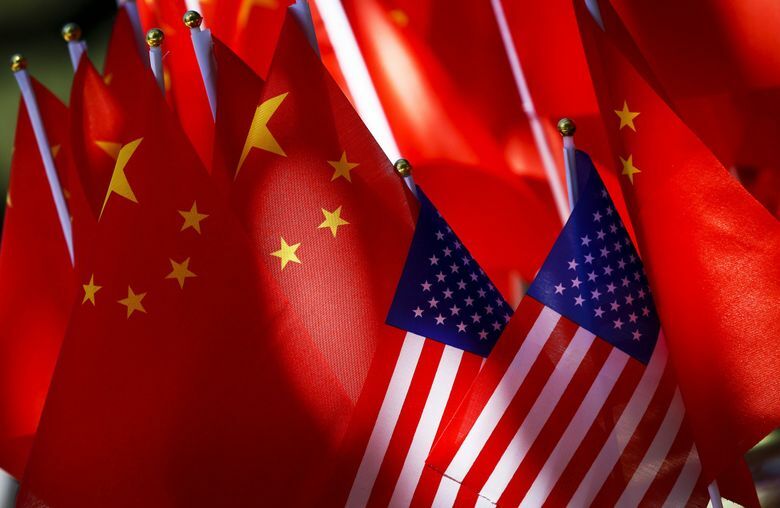 “China represents a significant and growing risk to the supply of materials and technologies deemed strategic and critical to US national security,” the report states. Then comes the problem of “Trojan chips” in an era where every “defense system” from the costly and controversial F-35 Joint Strike Fighter to the equipment carried by the lowliest grunt depends on advanced tech. This was a plot line in “Ghost Fleet,” a novel by P.W. Singer and August Cole about a fictional Sino-American war. But the Pentagon takes it dead serious. The president blurts many irresponsible and uninformed things. But that doesn’t mean everything from the administration should be dismissed. The 139-page Defense Department report, combined with the Businessweek article, describes a situation that is both grave and ominous. Please read them. Some concluding context: Last week a Chinese destroyer hotdogging an American warship nearly caused a collision in the South China Sea. A trade war is not the only conflict into which we are sleepwalking. • The first Pacific International Lines (PIL) cargo vessel in years arrived in Seattle, the north harbor of the Northwest Seaport Alliance, on Saturday. This marks the first PIL call here since 2014. The Kota Pekarang, on its maiden voyage, is 1,100 feet long and has the capacity for almost 20,000 twenty-foot equivalent (TEU) containers. • Washington was No. 2 among the states in annual per-capita personal consumption growth last year, at 6.9 percent. The national growth was 4.3 percent according to the federal Bureau of Economic Analysis (BEA). Idaho’s increase was first at 6.9 percent. Oregon grew 5.3 percent and Alaska 3.5 percent. • At 5.2 percent, Seattle-Tacoma-Bellevue saw the second-largest rise in real gross domestic product in 2017 among metropolitan areas, per the BEA. Austin was No. 1, increasing 6.9 percent. Metro Seattle’s GDP adjusted for inflation was nearly $313 billion. That compares with $257 billion in 2012. Our metro also continues to punch above its weight: Phoenix, with a million more people — posted GDP of $100 billion less.